Recently you may have noticed from our Instagram and other social channels that we’ve been hanging out with the Pinterest people while they were in town from San Francisco. We weren’t just chilling in Starbucks and attending parties to eat cake pops however – we’ve been not so secretly pinning as a part of their Pin It Forward UK campaign. Pin It Forward UK is Pinterest’s announcement to the UK pinners that it has decided to create a UK specific Pinterest. Something that rings true with our own ideals. The UK Pinterest will be unrecognisable when compared to the original Pinterest, it will even share the same domain, but through the use of geotagging and IP Addresses, Pinterest will take into account that fact that you are in the UK and ensure that you are shown UK relevant content. Again, something that sits well with our UK centric ethos. It also means that Pinterest will finally display in the correct English, or British English as our friends across the pond like to call it. With all this UK related energy surrounding Pinterest at the moment, they reached out to select bloggers and online folk to join in a very utopian campaign – Pin It Forward UK. The name kinda sums it up without need for explanation, but we’ll go ahead anyway. Pin It Forward UK is Pinterest’s way of reaching out to online movers and getting them to talk about Pinterest, but more importantly to talk about another Pinner, suggesting them in a Pay It Forward manor. For example, we are paying it forward to London menswear blogger Josh Leigh, a.k.a. Preposity. Be sure to check out his Pinterest page and follow the boards you like. 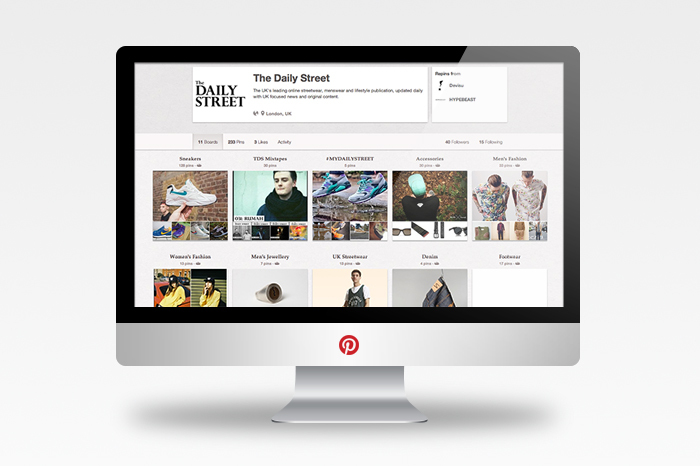 Last thing to mention is to check out The Daily Street Pinterest page. We’re still pretty new to the Pinning game, but we’re making up for lost time as a few of us have become a little addicted to the platform (you can see a few examples of our boards on the iPad minis below). It’s also worth noting that Pinterest makes for some good puns. I’ll leave that to you. Be sure to drop your Pinterest usernames and profile links in the comments section below so we can check your profiles out as well. If you’ve yet to get on Pinterest, we advise you get with the times and get involved – we’ll be adding a lot of Pinterest integration to TDS over the next month, so keep an eye out. Great post Alex! It’s great to hear the UK-relevant content hits close to home. Love your TDS mix-tape board in particular.